The Centres of Excellence (CoE) for training in Satellite Meteorology are sponsored by one or more Satellite Operator and/or Agency. 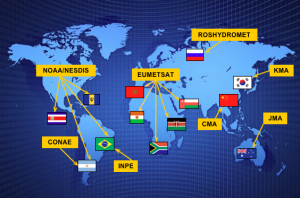 Once completed, the whole network of CoEs will address training needs in all WMO Regions and WMO official working languages. VLab links between Centres of Excellence (represented by their national flag) and their supporting satellite operators (highlighted in yellow). Status: November 2012.
activities and developments. Several Regional Focus Groups are being organised by the CoEs to widen the access to training events and training resources to other countries in their region.